A family counseling degree prepares students to pursue a wide variety of careers in the counseling field, such as providing assistance to individuals and families suffering from a large range of mental, emotional, and interpersonal issues. Family counseling degree programs teach students how to help families communicate better, improve relationships, and improve the quality of life. The programs provide instruction on both theory and research of family therapy, such as relational theories and family development theories. Coursework varies by program, but common courses include introduction to family counseling and theory, ethics in family counseling, personality theories, family systems, psychopathology, advanced family counseling theory and practice, and clinical applications in family therapy. Many programs include coursework, field experiences, internships, and residencies to prepare students for state licensure. A family counseling degree is a great choice for individuals seeking to make a difference in the lives of individuals and families suffering from various problems, such as adoption, divorce, death, or illness. The degree is intended for those who are comfortable with the personal aspects of family life. Graduates of the degree program reap various benefits, including a wide range of career opportunities that are both rewarding and lucrative. To find the best family counseling degrees, students should consider various factors. The main aspect is ensuring a school is accredited. Accreditation demonstrates that a college or university has met certain standards to offer high quality postsecondary programs. Another helpful characteristic is ranking, and many publications rank institutions based on various criteria. Northwestern University and Ohio State University are examples of top schools that offer family counseling degree programs. Northwestern University offers a Master of Science degree in marriage and family therapy and the program focuses on family and couple therapy, but also provides education in individual therapy. Students are required to complete a clinical internship where they gain 500 hours of face-to-face interaction with clients and over 250 hours of individual and group supervision. Ohio State University offers a doctorate program in couple and family therapy and it focuses more on research and scholarship that clinical experiences. It prepares students for careers in research and academia. In addition to the campus based programs, Liberty University offers one of the best online family counseling degree programs. 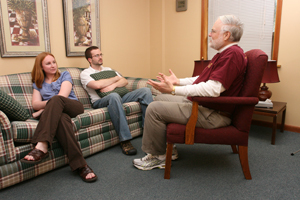 Students are able to select from nine start dates for the master’s degree program in marriage and family therapy. There is a variety of family counseling careers for graduates. The options include family counseling, couples therapy, and substance abuse counseling. Family counselors provide therapy to families seeking to solve various types of conflicts. They strive to change behavior, improve communication, and prevent family crisis. They commonly use talk sessions to help family members discuss their needs and feelings. Couples therapists provide therapy to married and unmarried couples seeking to work out their problems and improve communication. They help them cope with many issues. Substance abuse counselors help individuals who are suffering from addictions to drugs and alcohol. They help them overcome their addictions by providing therapy sessions and assistance with rebuilding their lives. The family counseling salary differs significantly on a variety of aspects, such as city, education, work experience, and benefits. In general, family counselors earn an average of $54,000 per year; couples therapists earn $72,000; and substance abuse counselor earn $45,000. A family counseling degree prepares graduates for many different career options that offer competitive salaries.